Eating out at restaurants is fun and hassle-free, but it can make sticking to your diet seem like an impossible feat. It’s even harder if you’re out celebrating and letting loose with friends, family, or coworkers. But, at Garry’s, we do our best to make sure the menu accommodates everyone’s needs, and that includes healthy eaters. Here are some tips and tricks that can help make eating healthy while eating out easier. Eating healthy while eating out starts with choosing the right restaurant. If possible, try to go to a place that you know will have healthy options available. And, if you’re following a specific diet, like gluten-free or ketogenic, check the menu first to make sure they have a dish that accommodates your needs. If nothing else, do your best to avoid the soft drinks. Most sodas have a high amount of calories and carbohydrates, so you’re better off just ordering water instead. But, if you need a little flavor, choose iced tea, lemonade, or coffee. Get the meal started on a good note with a healthy appetizer. For instance, get the Seared Tuna at Garry’s, which features a pan-seared, chilled ahi tuna with wasabi cream sauce and a flavorful Thai-inspired spice rub. Eating healthy doesn’t have to mean “no flavor”. If you’re trying to eat a low-fat diet, the menu at Garry’s offers a low-fat Caesar, among other options, for you to enjoy. Soups and salads are almost always a healthy choice. However, some might have some not-so-healthy toppings. But, a healthy chopped salad or bowl of Maryland Vegetable Crab Soup should do the trick. Unless you’re ordering it fried, seafood is usually a safe bet for eating healthy while eating out. Garry’s has plenty of seafood items to choose from, such as blackened California Rockfish with sliced avocado. Or, the Severna Park Coconut Shrimp, which is made with coconut-crusted jumbo shrimp and veggies, is another excellent choice. Stick with proteins that aren’t fried. And, if you’re not in the mood for seafood, you can always choose steak, pork, and chicken for your source of protein. As long as you avoid the fried foods, you should still be on track. When you order an entrée at Garry’s, you can choose from a side salad, sautéed spinach, sweet potato fries, a fresh fruit cup and more to help you stick with your healthy diet. At the end of the meal, split your dessert with a friend or family member. That way, you can still enjoy a sweet treat, but with half the calories. When eating healthy while eating out, don’t be afraid to request modifications and ask questions. Our servers are always happy to provide any nutritional information you might need. And, if you’re gluten-free or have any other allergies or sensitivities, be sure to let us know so we can triple-check that your meal is right. 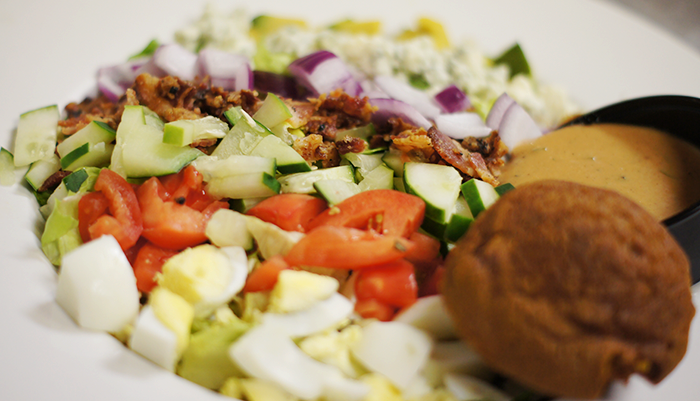 With a large, diverse selection of healthy menu items, you can confidently dine at Garry’s! So, whether you’re coming in for breakfast, lunch or dinner, you can feel good about the healthy, fresh ingredients used in every meal.